In my travels, I've reviewed a lot of iOS styluses for those who want to sketch, write, or paint on their devices. But I've never really played around with styluses on the Windows and Android side of the aisle--unless you count a very brief stint with a Wacom-enabled tablet when I was in high school. So I was naturally curious when the N-Trig DuoSense Pen 2 came across my desk. The company advertises the pen as a pressure-sensitive drawing tool, packaged with certain laptop and tablet systems running Windows XP, Windows 7, Windows 8, and Android (Ice Cream Sandwich). It offers 256 levels of pressure sensitivity in compatible applications, a hover mode, and programmable buttons. In form factor, the pen reminds me very much of a Wacom stylus: slim, black, and tipped with a small plastic nib. In addition, it's run on an AAAA battery. N-Trig paired my review unit with a 7-inch HTC Evo running Ice Cream Sandwich. So, how does it compare to Wacom styluses and iPad offerings? Read on to find out. If you insist on using a stylus as a navigational tool, the DuoSense is perfectly acceptable. The nib slides fluidly over the Evo's screen, and there seems to be no lag in communication between pen and tablet. As a sketch tool, the DuoSense runs into many of the same ups and downs as other styluses in this category. It's pressure-sensitive, but the 256 levels available aren't represented as well as they could be, due to inadequate app implementation. The plastic nib is slim and as close in diameter to a pen as you're going to get, but it doesn't have enough spring to adequately clone the paper drawing experience. On top of that, even the best manufacturers have problems with friction when applying plastic to glass--the pen is just too slippery on the tablet's surface. This all starts to sound a little negative on the DuoSense, but they're all common problems in the stylus market. Even heavyweights like Wacom run into them. The DuoSense tries to address these issues, but it doesn't solve them. For one, I wish the software integration was better: The 256 levels of pressure just don't feel like enough when sketching in an app like Sketchbook Pro, and the nib isn't springy enough to capture light dots accurately on the digital page. Additionally, I wish the DuoSense offered some sort of grip cushioning--my hand started to cramp up after just half an hour of sketching on the tablet. 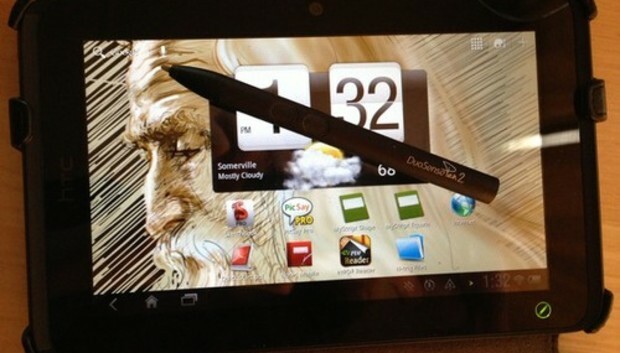 In theory, the stylus uses palm rejection technology, allowing you to put your hand on the screen while drawing. In actuality, this works pretty well, except along the edges. I repeatedly ran into a bug in Sketchbook Pro where I'd put my hand down on the edge of the screen first, then the pen, and the app would render a nice long line between my drawing and that edge. Writing and PDF annotation is one place where the DuoSense shines, although that nib is still too slippery for clean, accurate printing. The palm rejection tech worked flawlessly in both MyScript Notes Mobile and ezPDF Viewer on the HTC Evo, allowing me to write down quick notes and annotations without any strange lines appearing on the screen. Like with most styluses, cursive writing seems to be the winner when it comes to clean notetaking. Print letters tend to get over-curved when writing quickly. For the Windows 8 devices paired with a DuoSense--a Sony Vaio Duo 11, for example, or Asus Taichi--or one of the HTC tablets the DuoSense supports, the stylus will likely be a decent addition. It's not anything groundbreaking in the stylus field, but if you plan to sketch or take notes, it's a nice tool to have.